Why are Sikh Gurdwaras banning the entry of the Indian Leaders but MLA Amrik Singh Dhillon Honoured? At the end of 19th Century, we have been on a big growth around 22 million in 1990 In 2016, demographers had the NRI's population at 28-30 million and by 2030 it is estimated about 40-45 million. NRIs Helping India but NRIs are Betrayed: The repatriation of funds to India by NRIs is among the highest among expatriates in the world. On the other hand, In India, NRI’s properties are being grabbed. It is a big business in India and several ruling party senior leaders are hand in gloves in this property grabbing trade. NRIs cases are delayed by months to years. NRIs become very upset when any business dispute occurred and contract would not enforceable because of delay. We have 100's stories of NRIs who started the projects in India, most of them made them near to bankrupt and started their life again. NRIs believe that it is a peaceful way to protest against the Indian leaders especially Punjab leaders, shall not be allowed to participate in any social and religious programs including stage Saropa in Gurdwara , Nagar Keertan’s stage sharing and recognition by Gurdwara management . These all leaders are responsible for the June 1984 military invasion of Sri Harmandar Sahib and 40 other Gurdwaras; destruction of Sri Akal Takhat; genocide of Sikhs in Delhi and throughout India in November 1984; constant looting of Punjab river waters, and unlawfully holding Sikh Political prisoners in Indian Jails even when they have completed their jail terms. There are hundreds of victims of blackmail and extortion, involving NRIs in the criminal cases registered in India, without any punishment to the blackmailer. Most of the cases are reported to take between 5-10 and 20 years. Misuse and Mockery of Indian law and Judiciary must be stopped and Blackmailers punished. “Amrik Singh Dhillon, MLA from Samrala, is one of the most visible faces in the top leaders of Punjab who likes to help NRIs all the time,” said NRI Amrik Sidhu of Riverside, California. 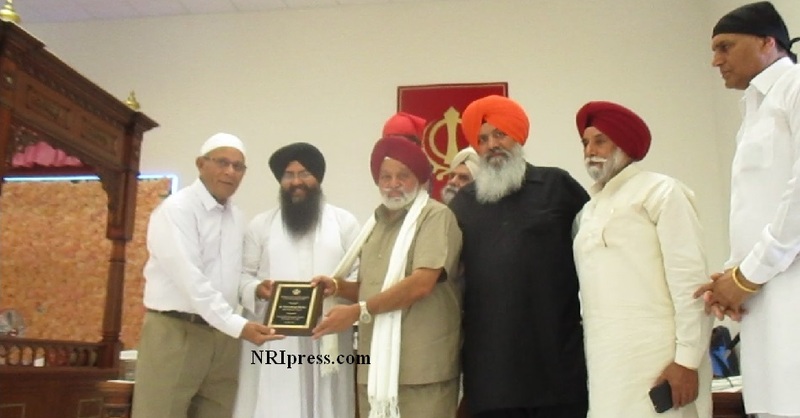 LA Community Leaders decided to honour him for his services to NRI community. He is considered honest politician- puts the good of the people before personal gain, have a good understanding of their strengths and weaknesses, listening to those that are affected by political decisions, his belief expands so that it includes everyone’s beliefs and makes a sustainable promise and is a man of his words. 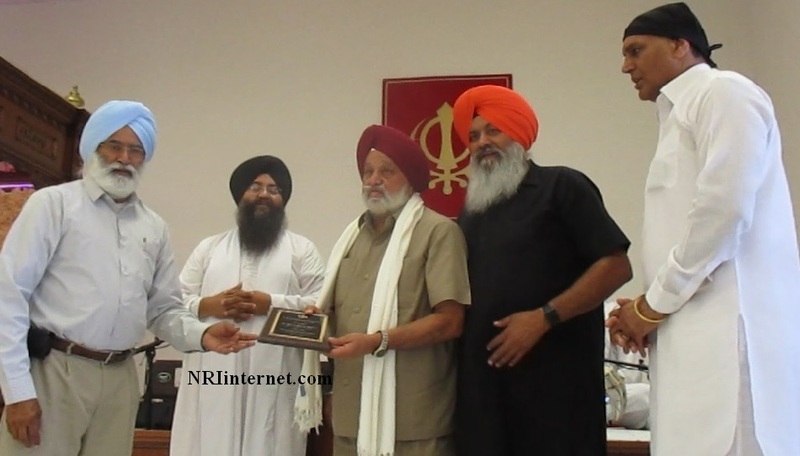 Amrik Singh Dhillon praised the Sikh community for their aptitude and said that he felt proud. He also acknowledged that during his visit he learnt a lot and would take some of the attributes learnt with him. He said he would try and persuade his collegues in the Punjab legislature to emulate some of those ideas. S. Amrik S. Dhillon MLA also donated funds to the Punjabi school run by the center. The congregation learnt of S. Amrik S. Dhillon’s integrity in the congress party and how he has been winning the Samrala district consistently since 1997. 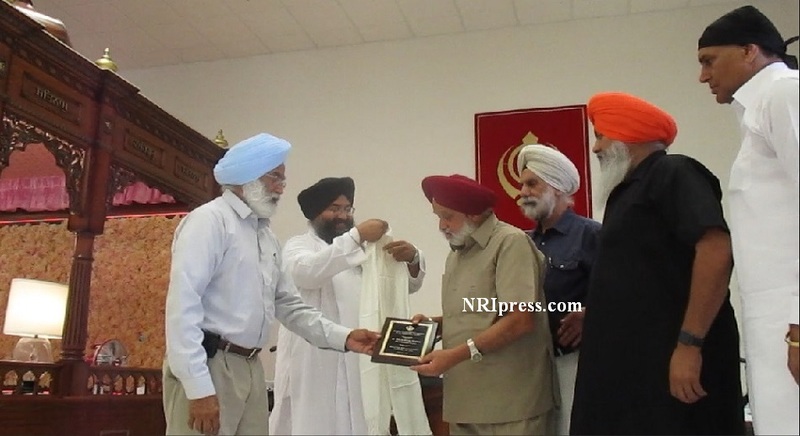 On Sunday August 5, 2018, S. Amrik S Dhillon, a visiting MLA from the district of Samrala Punjab India was honored by the Inland Sikh Education Empire in Riverside California. The MLA who was on a private visit to the USA had been staying with relatives in Riverside California USA. S. Amrik Singh Dhillon toured the entire US west cost and more was very impressed by the successes and achievements of the Sikh community. Other prominent and supporting community members namely S. Kaur Singh Sidhu (Right) and Gurjpal S. Mannan (2nd from Right) were also present. Amrik Singh Dhillon contested elections from Samrala five times and won four times. (1997, 2002, 2012 and 2017). He is a member of the Indian National Congress. His son, Kamaljit is the man behind his everyday election campaign.Kamaljit, who is also a treasurer in the Punjab Pradesh Congress Committee (PPCC), has been actively working to pacify the dissidents within the party. Kamaljit's son Karanvir Singh Dhillon (27) holds daily meetings with youngsters of the constituency. He meets young voters and informs them about the development plans of his grandfather for the constituency.